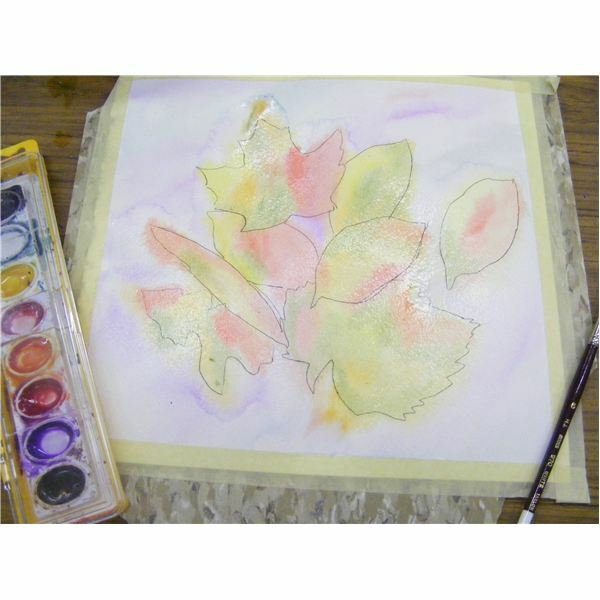 This watercolor art project is an easy art project to do in fall or spring. Students can easily create contrasting backgrounds by combining reds, blues and purples. Several leaf shapes are painted with special details added later. 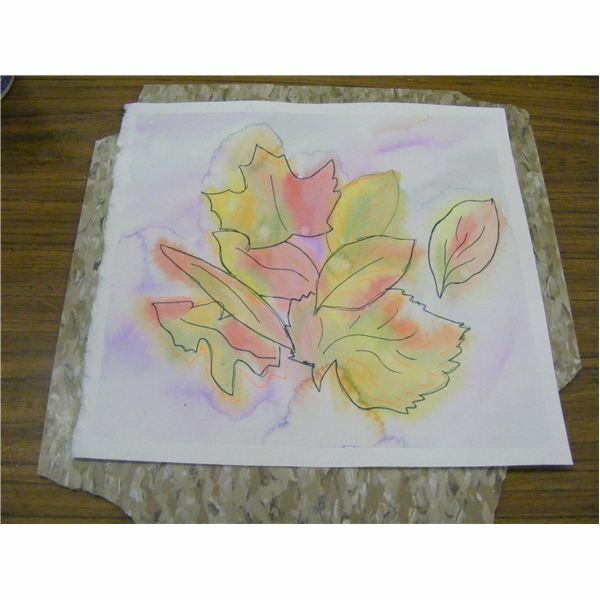 This is a versatile watercolor project that can be used for fall leaves or spring flowers. This is part of a series of watercolor projects using simple materials and seasonal themes. Using the masking tape, tape a ¼ inch border around all 4 sides of the paper. Use an 8 1/2 by 11 inch paper so that it can be framed afterwards. Tape the watercolor paper to a hardwood board, an old tile or table. This watercolor painting technique allows the project to be tipped to move the paint around. You can use 4 1/2 by 6 1/2 inch paper for younger students to create a smaller project. Using different leaf shapes cut out of manila tag paper, trace several leaves onto the paper. They can overlap each other and touch the edge of the watercolor paper. 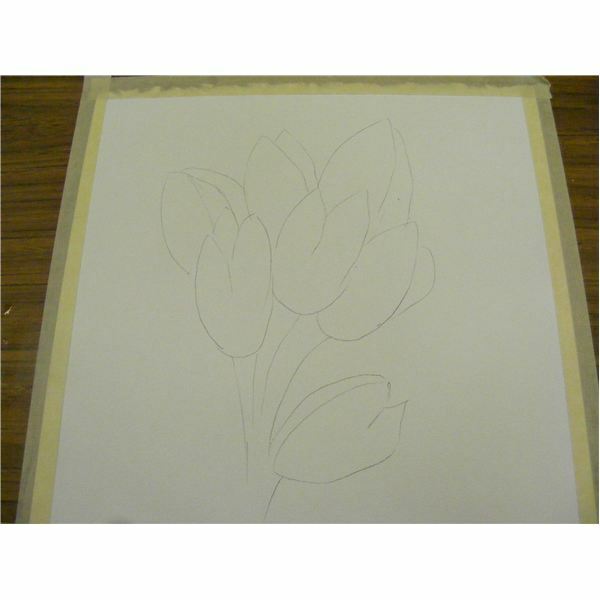 If doing a spring theme, trace several flower shapes on your paper and add stems. Tulips or daisies are identifiable flower shapes. One of the leaves can be separate from the group. 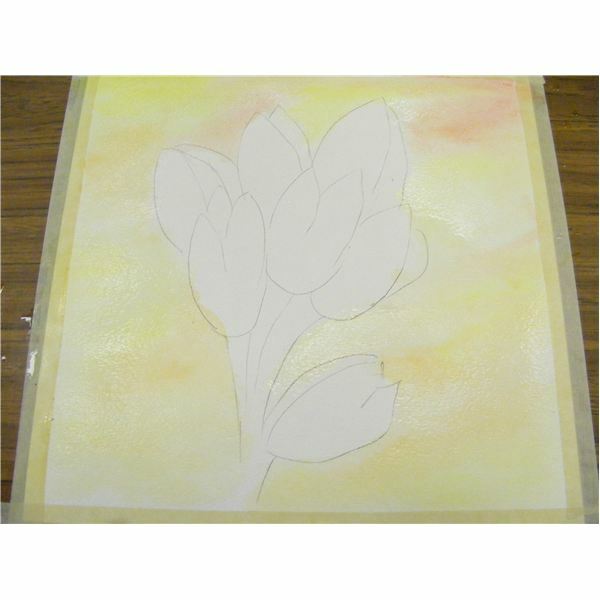 Wet the background of the watercolor paper with clean water first. Paint one or two colors in the background such as purple and blue which contrasts to orange and yellow fall leaf colors. Have each paint color touch the other so the colors blend. Tip the board left or right so this happens. If doing a spring painting, paint in colors such as yellow and green for the background to be a contrast to the purple and pink flower colors. Wet one leaf at a time with water. Paint in three colors on to a leaf. Reds, oranges, yellows and greens should touch each other so that the colors blend into each other. When painting in the next leaf, the area touching the first leaf does not have to be the same color. For spring flowers, paint in purples for crocuses, yellows for daffodils, pinks for tulips or colors that suit the flower. The water will make the flowers blend with the background. The pencil lines are only a guideline and will not stop the water from flowing. Use a graphite pencil so that the marks can be removed with paper towel if you like. 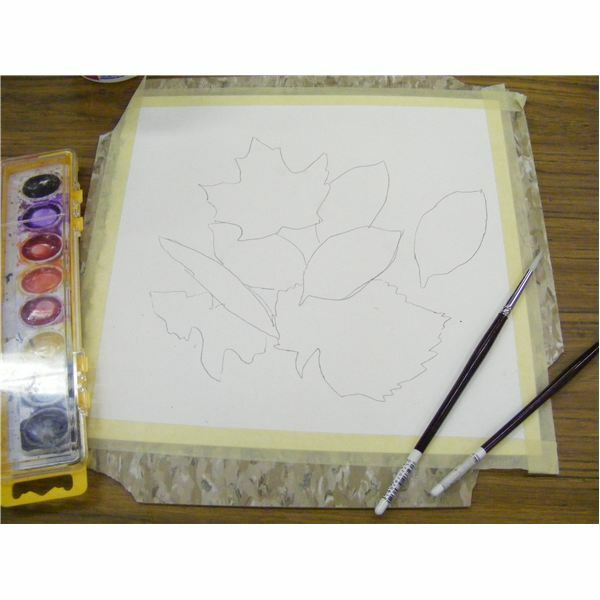 Once the painting is dry, a fine sharpie marker can be used to define leaf veins and stems. Details on flowers can be added such as stamens and pistils or outlines of petal shapes. A fine gel pen in different colors can be used to create lines on the flowers. For watercolor paper and paintbrushes see part 1 of the series. Water the entire surface you are working on first. Change the water often so it does not get too cloudy. Blot up extra water that may puddle on your paper by dipping the brush in the puddle and dabbing it on to paper towel. Let the paint colors touch each other to blend. Try not to paint colors overtop of each other or the effect is a brown color. Try not to mix the colors in the paint tray. Let the paint blend on the paper by letting the water do the work. 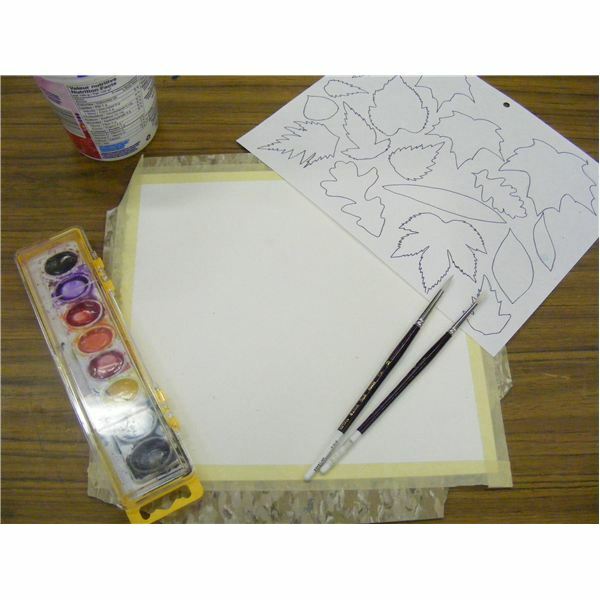 Use leaf or flower shapes that at smaller than your paper size so that 3 to 5 can fit on the paper. If using the same flower shape you can group them into a bunch or bouquet and draw stems for the group. Use the lesson to teach about fall colors in nature and how many colors can be found on one leaf. Bring in real examples to demonstrate colors. Have the students identify the leaf types. Use the lesson to teach about flowers and bulbs for storing energy. Explain why crocuses, tulips and daffodils appear first in spring. Teach about the parts of a flower and bring in real flowers for students to examine. Spring gardening catalogs will have many examples of the same flower in different colors. Use the lesson to teach about contrasting colors such as purple and yellow, blue and orange or red and green. Teach the warm colors on a color wheel such as the reds, pinks and oranges. Teach why the cool colors, blue and green are used with the warm colors in flower arrangements. Use the lesson to teach how some flowers (e.g. Gerbera daisies) which have white petals naturally can be changed to orange or pink by adding dye to the water they are watered with. Teach about how flowers are named such as Irises, Brown-eyed Susans, Pinks and Bluebells. 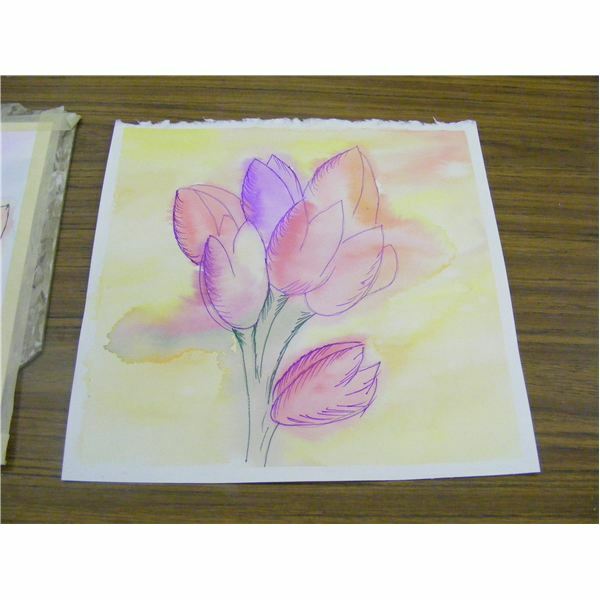 This simple watercolor painting project can be done in fall or spring. Students enjoy the blending of fall colors on leaves. The shapes are easy to trace and follow when painting in. 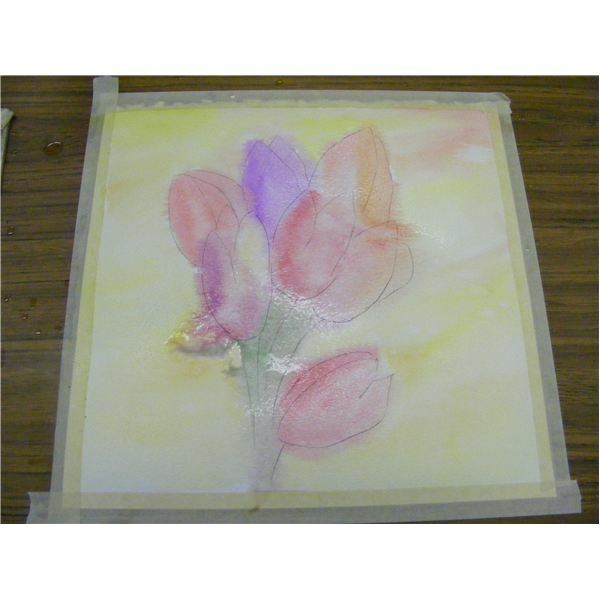 The flowers on the flower watercolor painting can have blended colors on them as well. The results of applying these watercolor painting techniques are stunning and students will find it an easy water color painting project.